Shadow of the Demon Lord uses Fortune to award players for a variety of reasons, though most often for great roleplaying, good decision-making, cunning game play, and outstanding luck. Armed with Fortune, players can bend luck to their will, strong-arming fate to serve their needs whether they need to escape certain death, deliver a killing blow to a tenacious foe, or to eke out a success when failure seems certain. The main rulebook leaves it up to the Game Master to decide how often and under what conditions a character might earn Fortune. As a result, the role Fortune plays at the gaming table varies from group to group. While the rule was intended to encourage players to become more immersed in the story and offer GMs a tool for rewarding those who do, many groups find Fortune to be an indispensible resource, especially at the lowest levels of play. This Game Play Focus zooms in on the Fortune mechanic and provides additional guidance for awarding it and a range of optional new uses to expand its power in play. While the new options are intended to enhance play, they might not be suitable for all groups, so it’s up to the GM to decide whether or not to implement them. The question that immediately springs to mind when considering Fortune is how often should you give it to your players? The answer is, of course, that you should award Fortune as frequently or as infrequently as you like, because the game rules never assume the player characters have it. Fortune is a luxury. For this reason, the rules are intentionally loose when it comes to frequency. Fortune takes the story out of your hands and gives it to the players, even if only for a situation, so you might be reluctant to give out Fortune at all, finding the whole concept at odds with a vicious and deadly world. Or, you might consider Fortune a timely parachute for the players’ cherished characters when they would plunge to their deaths. Both stances are, of course, correct, and the proper frequency is, in truth, whatever feels right for you. There is a point, however, when Fortune awards can be excessive. The Fortune Awards Frequency table shows you the recommended limit on the number of awards give out during a single adventure. Exceeding this limit might shift the balance a bit too much in the players’ favor. At the start of each adventure, the group has a pool of Fortune points equal to the amounts suggested in the Fortune Awards Frequency table. Keep the number of points in the pool a secret, as the players ought not to know when their luck will run out. If the players are familiar with the table, you can adjust the starting number up or down as you choose. Any player can expend a point of Fortune to gain any benefit normally available from expending Fortune provided there is at least one point left in the pool. Once a player expends a Fortune Point, he or she cannot spend another until everyone else in the group has had an opportunity to do so. In large groups, this means not everyone will be able to expend Fortune Points, but helps ensure a more even distribution and discourages hoarding. There are many reasons why you might award Fortune. A player could advance the story in a creative way, get an incredible success at just the right time, bring beer for everyone at the table, or even come up with a combination of talents and spells to produce something new and exciting. While you can award Fortune for anything, generally most awards come from story or gameplay reasons. You can award Fortune for story reasons. Story reasons include accomplishing certain objectives in the game or roleplaying a character in a memorable way or in a manner consistent with the character’s background and personality. Whether you’re running a published adventure or one of your own design, you should take a few moments to identify a few big story objectives—elements of the story that move the adventure toward the conclusion. You might note these on scratch paper or highlight the sections in the text for easy reference. Then, while running the adventure, you can award Fortune to the player who contributed most to achieving each objective. Find Jex’s daughter and liberate her from the beastmen. Unmask the Bonesmith as the villain. When you run the adventure, you might award Fortune to the character who pressures Jex into revealing her part in the disappearance of the miller’s children, to the character who tracked the beastmen prints to the Old Ruin, or who discovered the secret door in the Bonesmith’s shop. The trickiest reason to award Fortune is for roleplaying. Some players are better at it than are others and thus such players might gain Fortune more often than others. Clearly, this isn’t fair and so you should either balance the awards by granting Fortune for other reasons described here or by empowering the players to award Fortune to each other for great roleplaying. Player-granted awards are interesting since it contributes to team building and encourages the players to stay in character. To keep this manageable, any player can nominate another player for a good roleplaying award. If you or another player seconds the nomination, the nominated player gains the Fortune award. Chris’s character, Silas, for example, has a dark and twisted background. Cultists sworn to the Prince of Perversion, an aspect of the Demon Lord, stole him when he was young and he lived as their prisoner for many years, escaping just before he met up with his current group. During the adventure, the group meets a priest sworn to the New God. Chris plays Silas as being uncomfortable and hostile around the NPC, doing so in a manner that creates tension at the table and a potential complication for his group. Leslie thought Chris played his character wonderfully and Jason seconds the nomination, so Chris gains Fortune. Although the main rulebook instructs you to award Fortune for roleplaying reasons, you can also award it for superior gameplay and outstanding success. Doing so awards players who might not be comfortable “getting into character.” Best of all, it reinforces to the players that you are their advocate and that you not only want their characters to survive, but to succeed. Some suggested situations worthy of awards follow. When a character attempts some audacious action and succeeds, you might grant Fortune. Audacious actions can include anything you deem brave, foolhardy, or simply dangerous, when failure might have nasty consequences. For example, managing to leap off a roof to land on a moving horse so a character can chase down a runaway wagon to save a barrel of dwarfen whiskey should require a challenge roll and likely with one or more banes. You might grant the player Fortune if she manages to pull it off. Player characters often find themselves squaring off against deadly enemies, monsters spawned from nightmare and capable of abbreviating the group’s story in one bloody brawl. In a nasty battle, you might grant Fortune to the last character standing for finding a way to survive what was likely certain death. Sometimes, a success on an attack roll or challenge roll happens at just the right time. It can even happen with a fate roll. A disabled character might roll a 6 and heal 1 damage so he can rejoin the fight and deliver the killing blow. Another character might spring across a room to deliver the killing blow to a cult leader before he manages to drag forth a demon from the Void. Or, the goblin manages to find and pull the lever before the descending ceiling crushes everyone in the group. All these and other instances could result in a Fortune award since they represent key moments in the story where someone managed to avert disaster at just the right time. Finally, you can award Fortune for anything you deem awesome and fun. When something memorable happens in the game, something you and your friends will talk about for years, you should consider granting the player responsible Fortune. In short, if you find yourself impressed, amused, and entertained, the player should probably get Fortune as a result. Fortune is meant to be used and used often. When, and how, to use it is where the decision rests. On the one hand, Fortune is a parachute, a way out of a horrible situation when it invariably arises. On the other hand, Fortune doesn’t do anything unless it’s expended, so sitting on Fortune doesn’t help players avoid horrible situations before they start. The main rulebook lays out the basic effects for expending Fortune and they’re summarized here so you can reference them all in one place. The basic options for expending Fortune cover most situations a player might encounter in the game. Being able to turn a failure into a success, allows an attacking warrior to turn a near miss into a solid hit, while the ability to grant 2 boons could represent a shout of encouragement or a warning to an ally in need. Finally, trading out a d6 roll for a 6 could drag a dying ally from the brink of death or turn a bad damage roll into a good one. While sufficient for most groups, these were always intended as starting points. Fortune functions to give momentary control over the story to the player who expends it and thus Fortune’s uses can be expanded to cover a wide range of situations. But these aren’t the only ways to expend Fortune. What follows describe several new ways for players to use Fortune. Adding them into the game broadens Fortune’s powers and can inspire you to come up with other uses that fit your game and play style. A player can expend Fortune to impose 2 banes on any roll of a d20. This is a good way to save someone’s life by imposing the banes on an enemy creature’s attack roll. If a demon looks ready to take out the group’s priest, a player could use this option to eliminate the demon’s boons. Alternatively, a player could give an enemy just shoved off the edge of a cliff 2 banes to the Agility challenge roll it makes to grab the edge. This option makes it possible for one player’s Fortune to become another creature’s misfortune. A player can expend Fortune to replace the number rolled on any d6 with a 1. 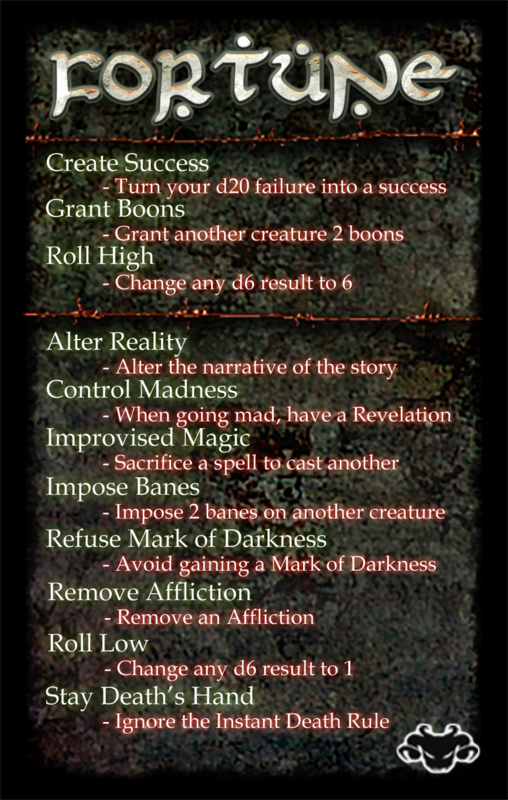 This option lets you nullify a boon by reducing the bonus to 1, force someone to fail a fate roll in the worst possibly way, or reduce incoming damage so you don’t hit your Health score and fall over. Causing bad luck in others might not be an honorable option, but these are not the most honorable of times. Whenever a member of the group would gain an affliction other than defenseless or unconscious, any player can expend Fortune to remove the affliction from that character. This use of Fortune helps remove afflictions when they would have disastrous consequences. A player whose character would gain a Mark of Darkness can expend Fortune to refuse it. Not all practitioners of the dark arts want to advertise their wicked ways. Expending Fortune in this way lets a character hide their Corruption from the looming eyes of the Inquisition as well as his or her comrades. A player that would go mad can expend Fortune to take the revelation result instead of the madness determined by the d20 roll. The characters find themselves confronting horrors all the time and such experiences can tax the mind. On the Madness table, the Revelation result strengthens a character’s resolve against such monstrosities, even if just for a little while. A player whose character takes damage equal to his or her Health score can expend Fortune to become incapacitated instead of instantly dead. If there was ever a reason to save Fortune, this might be it. The instant death rules are there to remind player characters no matter how tough they are they are not invincible. This Fortune expenditure might save them from an overwhelming attack or from a disastrous fall, but it might not save them from what comes next. A player that has discovered at least one tradition can expend Fortune to sacrifice the casting from one learned spell to instead cast any other spell of the same or lower rank from any tradition the character has discovered. Using this option lets a user of magic cast the right spell in the right situation. A player can expend Fortune to change the story in a minor way in order to keep the story moving forward. This Fortune use literally gives control of the story to the player who expends it, but only for a moment. The most liberal of Fortune expenditures, Alter Reality relies on strict GM oversight. Generally, this use should allow the group to bypass a complication so they can advance the story in a meaningful way. Examples include finding a key to a locked door the group has been unable to open, discovering a length of rope 20 yards long when the group finds themselves 10 yards short, or finding a witness to a crime in a crowded city street. Since this expenditure of Fortune can completely unravel an adventure, a GM is free to refuse the expenditure or modify the desired result in any way that fits the story. Shadow of the Demon Lord Now Available!